July 9, 2018 … Today Atlanta Mayor Keisha Lance Bottoms joined other City officials to break ground on the highly-anticipated Adair Court project. The new 91-unit mixed-income senior rental community is being developed by Woda Cooper Companies, Inc. and Parallel Housing, Inc. The $15 million development is located at 806 Murphy Avenue, between the MARTA West End station, Adair Park, and the Atlanta BeltLine Westside Trail. Atlanta BeltLine, Inc. (ABI) co-hosted the event. Also on the program were Councilmember Joyce Shepard who represents Atlanta’s 12th District; Mr. Brian P. McGowan, President and CEO of ABI; Commissioner Christopher Nunn, Georgia Department of Community Affairs; Dr. Eloisa Klementich, President and CEO, Invest Atlanta; and Mr. Denis Blackburne, Senior Vice President, Woda Cooper Companies, Inc. Along with open concept living spaces, including seven designed for those with disabilities, Adair Court will have a multipurpose community room, fitness center, computer room, laundry facilities, community garden and a covered gazebo surrounded by a native species landscape. The property will boast incredible views of the downtown Atlanta skyline. Cutting-edge energy efficiency is another key feature. “Adair Court will be built to very high energy efficient standards to comply with the Department of Energy’s Zero Energy Ready Home program,” said Mr. Blackburne who is leading the development. “This represents a significant leap in the sustainability performance for affordable housing.” US Green Building Council’s LEED v4 energy efficiency standards and Energy Star appliances will be incorporated, as well, which will contribute to low monthly utility rates, said Blackburne. The location of Adair Court is within walking distance from the MARTA West End station, directly adjacent to Adair Park, as well as in close proximity to many retail stores, banks, restaurants, churches and health care services. 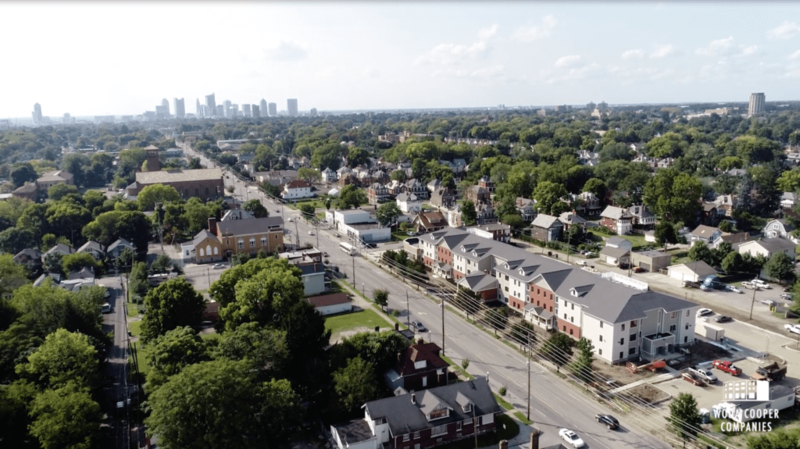 The head of the agency that allocated the housing tax credits also emphasized the importance of Adair Court to help address downtown housing needs. “Projects Like Adair Court are a proud example of the commitment of the Georgia Department of Community Affairs to ensuring that safe and affordable housing is available in a neighborhood that continues to transform with the Atlanta BeltLine,” said Commissioner Nunn. Bank of America was the equity investor and also provided a construction loan and Summit Community Bank provided an additional permanent loan. Woda Cooper Companies, Inc. and its affiliates are experienced developers, general contractors, and property managers specializing in the design, construction, and management of affordable multi-family apartments, senior communities, and single-family homes. Considered leading experts in the affordable housing industry, the Woda Cooper team is known for producing and maintaining high quality affordable housing. Affordable Housing Finance ranked the firm 6th overall among Developers and 29nth overall among Owners in its April/May 2018 issue. Woda Cooper Companies, Inc. has developed and currently manages more than 300 communities and 12,000 units, operating in 15 states. In addition to its Georgia office in Savannah, the firm’s headquarters are in Columbus, Ohio. Other offices are operated in Annapolis, Maryland; Shelbyville, Kentucky; Norfolk, Virginia; Indianapolis, Indiana; and Mackinaw City, Michigan. Parallel Housing, Inc. is a nonprofit developer based in Athens, GA, and is recognized for the development of energy efficient and affordable housing.